The Datacard SD260 card printer puts value right on your desktop. Save time and increase workday efficiency with this best-in-class card printer, ideal for many ID card issuance and id badging applications. Engineered for Earth-friendly performance. Now your ID card issuance can be fast, efficient - and green. 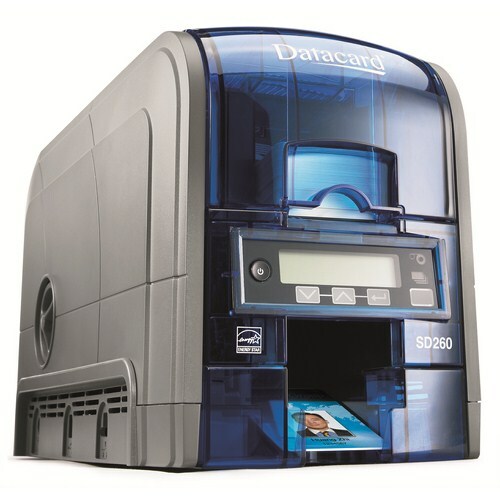 The SD260 is an ENERGY STAR qualified printer, and in addition, biodegradable cores with EcoPure additive and recyclable parts and packaging make it the industry's first environmentally friendly desktop card printer. Advanced technology for superior image quality. New TrueMatch printing technology creates vibrant, crisp and clean credentials that are both secure and visually impressive. The SD260 printer lets you produce predictably outstanding images by emulating the sRGB industry standard colour space for improved colour management. Intuitive operation simplifies card printing. There's no learning curve with the SD260 printer. The printer display panel automatically alerts users when supplies are running low. Installation and printer operations are easy to understand with the helpful documentation tools provided with the XPS Printer Driver installation. The browser-based printer manager makes it easy to control printer settings. Superior speed and reliability for worry-free printing. Never worry about jamming again with TruePick card handling. You can save work time and increase productivity by experiencing the fastest print speed in its class. Compact size creates more room on your desktop. The SD260 card printer fits on any desktop and is ideal for many card printing applications. It is equipped with a 100-card input hopper and 25-card output hopper for easier desktop functions. Please note that all printer rentals are on a minimum rental term of 7 days and do not include the cost of shipping or any consumables (except for cleaning cards - we will automaticaly include enough cleaning cards for your requirements). As everyone's printing requirements are different we don't want to make assumptions on printer ribbon type, therefore please ensure you order the ribbons that you need for your specific print job. The ribbons available for this printer are all listed below under 'Related Products'. Please also note that any part used ribbons that are returned with the printer will be securely destroyed as they will contain your data, which may be sensitive. The hire charge includes return shipping so all you need to do is tell us in the comments field of your order where you would like it to be collected from and any special instructions for collection and we will arrange for a courier to collect it at the end of the rental period. Should the equipment not be returned to us by the end of the agreed rental period, or is not available for collection by our courier on the agreed date, then the daily rate will continue to accrue. If the equipment is not returned to us within 30 days of the agreed return date then the full RRP will be charged on top of the rental cost. As we are a supporter of Project Genesius, the Metropolitan Police initiative to counter crime in the printing industry, we are only able to supply printers for rental to bona fide limited companies and evidence of which may be requested prior to acceptance of your order. Datacard YMCKT Short Panel Colour Printer Ribbon Prints per ribbon: 650 Manufacturer part..
Datacard Black High Quality Printer Ribbon Prints per ribbon: 500 Manufacturer Part Number: 53..
Datacard Black High Quality Printer Ribbon Prints per ribbon: 1500 Manufacturer Part Number: 5..
Datacard Dark Blue Printer Ribbon Prints per ribbon: 1500 Manufacturer Part Number: 532000-003..
Datacard White Printer Ribbon Prints per ribbon: 1500 Manufacturer Part Number: 532000-004 ..
Datacard Red Printer Ribbon Prints per ribbon: 1500 Manufacturer Part Number: 532000-005 In..
Datacard Green Printer Ribbon Prints per ribbon: 1500 Manufacturer Part Number: 532000-008 ..
Datacard Silver Printer Ribbon Prints per ribbon: 1500 Manufacturer Part Number: 532000-006 ..
Datacard Gold Printer Ribbon Prints per ribbon: 1500 Manufacturer Part Number: 532000-007 I..
Datacard Metallic Silver Printer Ribbon Prints per ribbon: 1500 Manufacturer Part Number: 5320..
Datacard Metallic Gold Printer Ribbon Prints per ribbon: 1500 Manufacturer Part Number: 532000..
Datacard Scratch Off Ribbon Prints per ribbon: 1500 Manufacturer part number: 5320..
Datacard KT Black Printer Ribbon Prints per ribbon: 1000 Manufacturer part number:.. Laptop with CardExchange™ Premium for use with ID Card Printer - 7 Day Rental If your job is .. Laptop with CardExchange™ Ultimate for use with ID Card Printer - 7 Day Rental If your job is..